8th Annual MID MAIN ART FAIR This popular event will take place this year on Sunday, June 10, 11- 6 p.m. 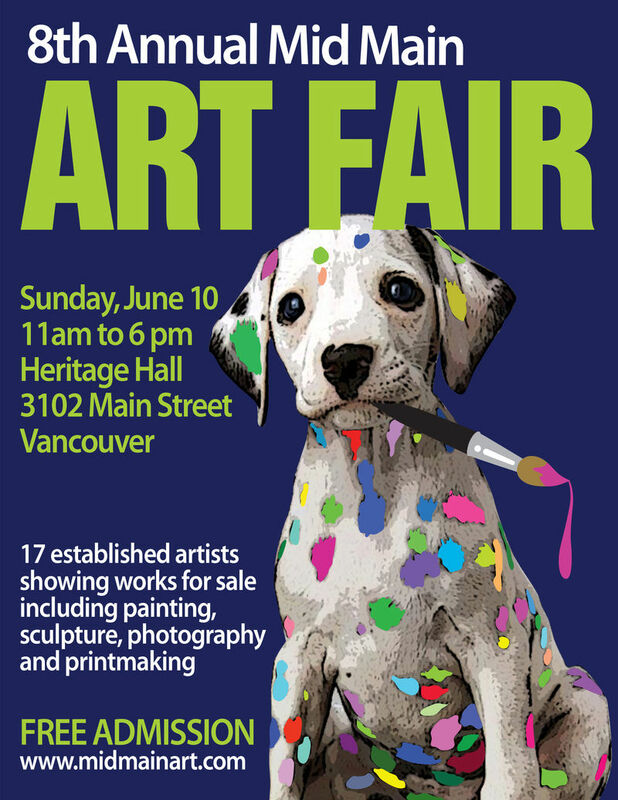 It was established to showcase and sell original art from established artists in the greater Vancouver area at the elegant HERITAGE HALL, located in the centre of Vancouver at 3102 Main Street, V5T 3G7. This talented group of artists will showcase work from abstraction to realism creating stunning art, in a variety of mediums such as watercolours, acrylic, oil, photography, sculpture, and printmaking. The 17 artists are Fran Alexander, Mariko Ando, Enda Bardell, Lorn Curry, Dave Denson, Jennifer Harwood, Louise Nicolson, Christine Hood, Jeanette Jarville, James Koll, Sonia Mocnik, Edward Peck, Camille Sleeman, Elisabeth Sommerville, Kathy Traeger, Jeff Wilson, Grazyna Wolski and Jennifer Harwood.